It seems that after Viagra's success, every manufacturer today offers our own version of an erection tablet. Let's look at some of those on the Czech market. Except for reference Viagra, it is a more or less random choice. I do not want precision or completeness: Every year new products are created and the old ones are gone. I tried to understand their composition and mechanism of action, which was not always easy. Some manufacturers did not consider the composition to be important. I have found that most erectile preparations have medicinal plants as active ingredients . Among those really effective are ginseng, cinnamon, bayonet, muira puama, yohimbe and others about their ( the erection effects I write in more detail here ). In the combinations offered, the medicinal plants are also supportive without direct aphrodisiac effect. I found products that I consider to be less effective because I can not imagine their effect pharmacologically. The problem with all these products is dosage. The pharmaceutical form of the capsule or tablet takes only about 400mg of herbal material, while the required amounts are calculated in grams. It is up to the user himself to understand that these capsules / tablets must eat the right amount or combine them with one-component ginseng herbs. Fortunately, potency is a health factor that men can easily notice, so finding the right dose is not so complicated. For example, you can check out my ginseng test guidelines - other herbs need to be treated similarly. Phosphodiesterase inhibitor in the NO cascade . In the field of erectional drugs, Viagra can be seen as a standard. If Viagra is used to a degree, side effects do not have to worry as much as many other common medicines. I think none of the herbal combinations achieve the same rate of action and is not as well quantifiable as one-component sildenafil. It is not essential that Viagra is synthetic and natural combinations are natural - and nature is just chemistry. The advantage of herbs is different: we are used to them evolutionarily, they have a longer duration of action and, in the case of adaptogens, they improve other physiological parameters than just an erection. Without studying this topic in depth, I would expect a positive interaction between Viagra and herbal tablets (mutual reinforcement, synergy). Clone Viagry. Phosphodiesterase inhibitor in the NO cascade. Clone Viagry. Again an inhibitor of phosphodiesterase in the vascular NO cascade. Amante Pills - active ingredients: Pink 150mg pillow, 150mg ginkgo biloba , ginseng 10mg, 20mg eleuterokok, 20mg Chinese schizandra, 20mg ginkgo biloba , 20mg Chinese teaspoon . As everyone sees, it is a list of adaptogens. The main active ingredient is undoubtedly a combination of ginseng (activates NO production) with an anchor (it works elsewhere in the erection cascade of NO, a phosphodiesterase inhibitor such as Viagra ). The question is sufficient dosing. Take a look at, for example, a teaspoon of 20 mg per tablet - that is, in a quantity corresponding to a single small green tea leaf. But if we disregard the need for higher dosing, it can be said that the Amante preparation is well assembled and is by no means a scam. The natural origin of Amante is proud, it is a little more complicated to get it. Arginmax is a good combination made similar to other natural combinations to improve potency. ArginMax Forte Capsules for Men contains three main ingredients: (a) herbal ( ginkgo biloba 11mg, schizandra 10mg, berry 67mg, saffron 10mg), (b) amino acid ( L-arginine 500mg, L-citrulline 150mg) mineral (lycopene 2mg, lutein 1mg, vitamin E 15mg, niacin 5mg, folate 85μg, vitamin B 12 2μg, selenium (sodium selenite × 5H 2 O) 17μg, zinc (ZnO 2 ) 1.4mg). Although my subjective opinion on the amino acid component is rather negative (in my view, less effective), the composition of Arginmax is a demonstration of pharmaceutical chemistry and MUDr. Radim Uzel does not have to be ashamed to be the face of this product . I personally tend to do preparations where the amino acid component is eliminated in favor of a larger quantity of herbs. In addition to ArginMax for men, ArginMax Forte is still available for women , but its composition is almost the same, there is, for example, slightly less arginine and, moreover, 13mg of vine leaf extract ( Vitis vinifera ). I am not able to find out how it is with ginseng in ArginMax: Lists of the composition I found no ginseng, on the other hand, for example, at www.sportovni-vyziva.net at the time of my visit it was written that ArgiMax for Men contains i ginseng genuine and ginseng american ( ), while ArginMax for women should contain only ginseng ( ). Random source in English lists 17 mg of P. ginseng and 17 mg of P. quinquefolius per capsule. Incorporating ginseng among the active ingredients of ArginMax would be a logical step, this combination directly after ginseng. For those who try ArginMax or other herbal tablets, I would recommend adding each batch of red ginseng root ( ginseng radix rubra ) . We are again returning a ginseng-armchair combination. Other herb combinations are different from Amante , although they are promising adaptogens (ginkgo, cinnamon). Erectan is proud of her herbal composition. Liderin is a product that does not emphasize its natural origin. It is a mixture of arginine - that is, as I have said several times, common dietary amino acids - and the yield of Pinus pinaster bark. It would be possible to laugh at Liderina that it is a mixture of turpentine and arginine in a quantity ten times smaller (604.67mg) than that obtained by eating the average cutlet. But I will not do it. From pine trees, this is not only a turpentine, but also a patented antioxidant extract of Pycnogenol®. It is virtually clear that the publication Strong2011fmp on the effectiveness of seaborne pine extract is paid by the manufacturer, but I would not say that the claim to the positive effect of pineal seaweed on blood vessels, inflammation , diabetes , menstrual problems can only be swept away with the table. Seafront pine can be an interesting medicinal plant and Liderin can be quite healthy. The amount of Pycnogenol® in the Liderin tablet is quite small - only 26.67mg, which is suspiciously low in herbal medicine. Therefore, I do not think - with a good waiver - that Liderin would have a chance to be an amazing means to improve the erection. My personal prejudice is that most users will be disappointed in this respect. But that's just my opinion. Perhaps it would seem to compare pine trees with other pines, especially our kneeling, which was once manufactured and sold as a medicine "greasy oil", which, as I see it, is still available in pharmacies. 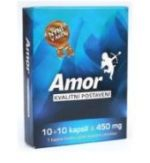 Amor (from the same manufacturer as Amante ?) Is a mixture of 114.3mg of arginine and eleutherococcus 19.3mg herbs, the yield of Peruvian cress (maca) incorrectly referred to as Peruvian ginseng 101.2mg, Amazonian muira puama 68.4mg and 146.8mg. Missing ginseng, the main effective combination is likely to be a mixture of anchor and muira puama. I'm not sure if this product is still available, because muira puama will probably be banned in the EU as usual. The Clavin erection product does not emphasize its natural origin and its only active substance - the plant with the arrowhead . Instead of "Clavin", this tablet might well be called Ultra Arrows, or something. The name of the curd is first packed in the trade name of the effective blend of Clavertin. Clavin, therefore, we first learn that it contains a special galenically modified Clavertin mixture, and only after this mixture contains 20mg of cinnamon plus 5mg of icarin, the most important active substances of the pit. 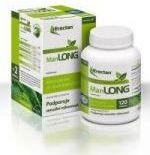 In addition, Clavertin contains about 300mg of less essential arginine . Ingredients: 500 mg maca gelatinized (extract), 200 mg arginine (L-arginine hydrochloride), 60 mg natural bark extract, 60 mg ginseng extract, 35 mg extract of marigold extract, 35 mg extract of medicinal cream , 33.5 mg vitamin E, 10 mg ginkgo biloba extract, 8 mg smilax , 7.2 mg zinc, 5 mg coenzyme Q10, 0.3 mg copper, 0.02 mg selenium, magnesium stearate, polyvinylpyrrolidone, microcrystalline cellulose. An appealing combination, 60mg of an anchor with 60mg ginseng can be nicely multiplied, but rather take a larger dose. Other herbs are also good, but there are still few, even if they are extracts. Vitamins and minerals also benefit slightly. Combination of 149.6mg of anchor , 22.3mg of muira puama , 6.1mg of ginseng , 4.4mg of ointment, 9.8mg of gin and 8.6mg of coenzyme Q10. Erectin XXL could call "XXL XXL". Of course, XXL is just like, for example, in the Erectan capsule there is a 220mg baton, that is, 1.47 times more than Erectin XXL. Yes, Erektin XXL still contains 20 milligrams of muira puamas, but 6mg of ginseng, that's low. Even the berth should be consumed in quantities of grams rather than milligram. As well as a whipper and a ginger. 9mg of Coenzyme Q10 will benefit, but not fundamentally. Still, I would say that Erektin XXL will be more effective than Liderin's erection . Viamax Pure Power is an illustration of a combination of less common herbal ingredients in an indication of improved erection - it could be worth the originality of the composition. In Viamax Pure Power, we find besides cinnamon Cinnamon (20mg), Greek haymaker (100mg), licorice, asparagus and Peruvian watermelon ( Lepidium meyenii ) , 10 other plants, everything in a pill (30-100mg) of Pink Elephant ). To be honest, most of these herbs are far from my target pharmacologically. Even Cuscuta chinensis , despite its name, I do not believe it improves erection. The Cistanche salsa jam ( Cistanche deserticola ) has a traditional indication in the area of erection. For some time, I suspected it was also a superstition, but it turns out that the glycoside acteoside of this lute has androgenic effects. As a proponent of herbs, I must admit that Viamax can not compare with the reference Viagra, but this does not justify the use of this harmless combination as "illegal" . 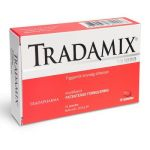 Tradamix is another professional product based on a groundbreaking ground from the Italian manufacturer . Anchor is combined with Ecklonia bicyclis and modified chitosan. A clinical study of the manufacturer demonstrating its effect is Iacono2012sat .